Good morning readers, firstly thank you for taking the time to read this article of mine. I am thrilled to share with you some new results using the Rapid Moving Water & Sunlight Reflection Method that I believe is a new step forward with the communicators. For some years now I have been getting all kinds of images coming through. 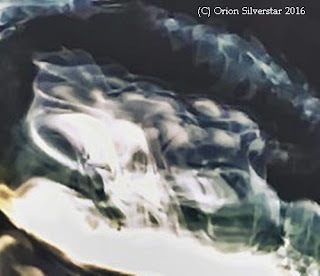 Some examples are, images of crimes taking place, images of bones, human faces and beings that are not human looking, objects like knives, tree`s, buildings, houses, places that do not look like anything found here on earth and more. Some of the images I have received are the faces of those that where celebrities while here in this physical realm. Also those that have been following my work for sometime have even noticed images of relatives and loved one`s that have crossed over come through and it is always encouraging when this happens. Sometimes the images have been small and other times large faces have shown through. However just a few weeks ago I starting receiving full landscapes that took up the whole photo and scenery that had many images within it. I have had this happen before using the Video Feedback Method, however not using the Rapid Moving Water & Light Reflection Method. I was quickly lead to believe that all the images I could see within the full photo frame where related to each other. Also that those doing the communicating where telling me a story and they where telling it to me in the form of images within one more larger scene. As I have not been the first to try this method of Instrumental Trans-Dimensional Communication, I have not to date seen anyone getting full scenes quite like this and nether had I been getting them in my years researching and practicing Instrumental Trans-Dimensional Communication. I was very captivated and mystified at the same time in regards to these things the communicators where showing me and allowing me to share with the world and still are. I have now even wondered if different photo`s within the same session maybe related to one another? As there is a very big possibility and this is definitely something I will research into more in the future in regards to this method of Instrumental Trans-Dimensional Communication. Here is an example of one of these photo`s that I am talking about, the whole container that I was using, which was a black container, was filled with many images showing that there was a lot going on here. If you have heard of the saying "A Picture Tells A Thousand Words" well the communicators have been really making use of this here. You may have to take a closer look at this photo to see all of what is going on and the amount of detail that can be seen. 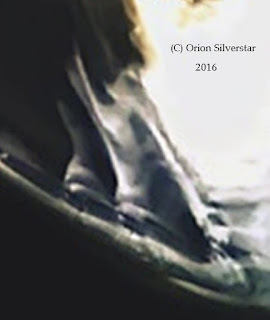 However I have taken out some of the images that to me felt important and made them into photos themselves for the benefit of my readers and viewers that have an interest in this spiritual work. So all of the photo`s I am now about to show you below are from the one photo above and as I say are, I believe all related to one another. 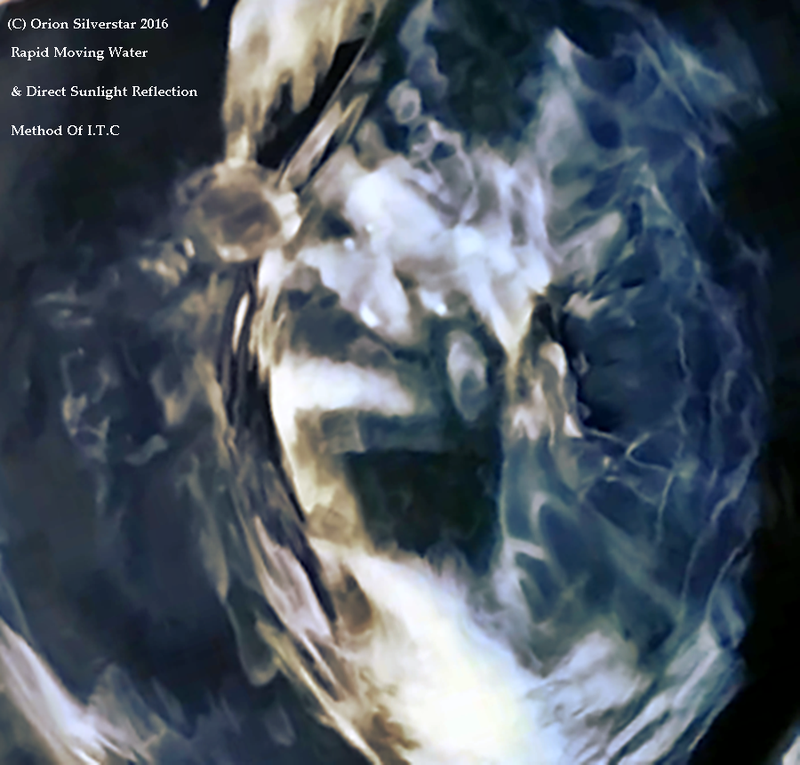 I should also mention that some of these images where found on rotating the main photo above around which I found was also very interesting. Due to this my advice would be when getting full photo`s like this, where you can clearly see lots of objects in it. 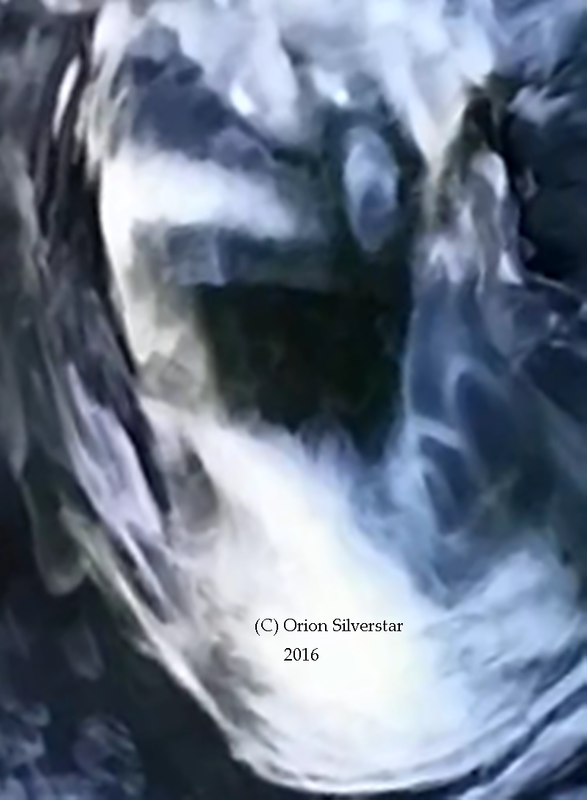 Always rotate it around in all directions as it most likely will reveal much more, this is the way the communicators work when using this method of Instrumental Trans-Dimensional Communication. These are all the images to come out of that one main photo above. Here is another photo below, that I wish to show you that also I received in this same session from the communicators. If you look closely enough you will see what looks like a black tunnel, I believe this to be an open fireplace and that this scene is set a long time ago, maybe in the Victorian time frame. To the right of the photo standing next to the fireplace is a lady looking towards the viewer which is us. She has long hair and is wearing a low cut long flowing dress, her hands are behind her back as it looks like she is posing for the camera. Right next to her is an oval shape which maybe a mirror as it looks as if this ladies reflection is seen within it. If you look up above the lady you will see the face of a man with a very serious look on his face. This man looks as if he has his arm around a tall pointed tree which I get the feeling is a pine tree, the mans hand can be seen just above her head. Given that this is a pine tree, tells me what time of year it is, around Christmas time and the open fireplace tells me that it is in winter time, most likely the Northern Hemisphere. The ladies long flowing dress tells me the time frame. Most houses during this time had open fireplaces in every room for heating. 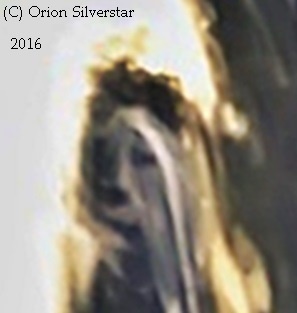 Also in the dark area of the photo seems to be another lady in a long dress and other figures there with her. In this photo all these images within relate to each other and the communicator is showing us a scene from a moment in the past in a hope that we may understand the message they are trying to bring to us. As I say, this photo below and the one at the top of this article, the communicators are speaking through the photo and the images within. So to me it is important to look at the photo in great detail as they the communicators with show more clues as to what it is they are trying to express to us. As I have said above, many photo`s from the communicators mean many different things and by observing the photo`s closely help to understand what they are all about. 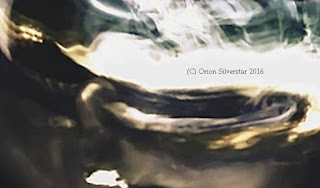 The photo below is a cropped and closer image of the lady in the long flowing dress standing next to the open fireplace with her hands behind her back as she poses for the photo. To me these new full scene photo`s are very fascinating and I hope they are to you also. I hope that you found this article interesting, any questions please feel free to ask me in the comments below thanks. Please if you can, keep the comments in relation to this article I have published. If you just wish to show me some support and feedback I also welcome your comments below thanks. I saw more than you mentioned in your photos up top and would love to share that with you. I am not a part of your page yet and am not familiar with the different Comment options. ohh that was easy :D Okay I'm in. My no. 1 is the first single photo from the top photo. 2.I see the torso and head of a man that looks like Bruce Lee in it. There is another figure just behind him. 5. totem pole of faces again but with a cow head on top and bottom. I would love to know how to do this. Years ago I 'spun' a simple photo of an eclipse and got soooo many different things out of one picture. I am amazed at the people in it by the last one ! I would love to be able to separate them while maintaining their details. Hi Mardub, thanks for your comments here at my blog. Some of the things you have pointed out here I can see but not all of them. Yes there is always much, much more when it comes down to this form of I.T.C that can be seen. However in writing this article I wanted mainly just to focus on some of the more clearer images. Mainly for those that are new to this method of I.T.C and even maybe scrying itself. Those with an eye for detail or a trained eye will always see more. Sometimes when people see things that I am unable to, I believe those images where meant as a message for them. If someone believes that nothing is by accident as I do then those that view the photo`s are lead to do so. One example I can give in relation to myself. The other day I put a thought out there to the powers that be through telepathy to receive an answer to something. I was online the next day and came across a website I was not directly looking for and right there on that website was my answer. In fact it when deeper, answering other questions and putting some pieces of the puzzle together nicely for me. I right away did a ritual and thanked my guides and the powers that be. 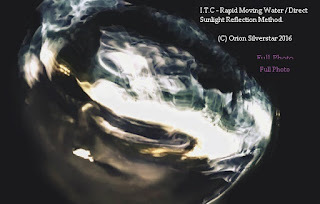 To find out more about this very interesting method of I.T.C I have an article here at this blog page called "The Rapid Moving Water & Direct Sunlight Reflection Method of I.T.C Research". This should help you understand it a little bit more. If you have anymore question please feel free to ask me here. Thanks again for pointing out those things within the I.T.C photo`s for me. Have a great week - Orion.